Stand for the Flag, Kneel for the Cross’: GA Cheerleaders Accused of Supporting Police Brutality, REALLY? 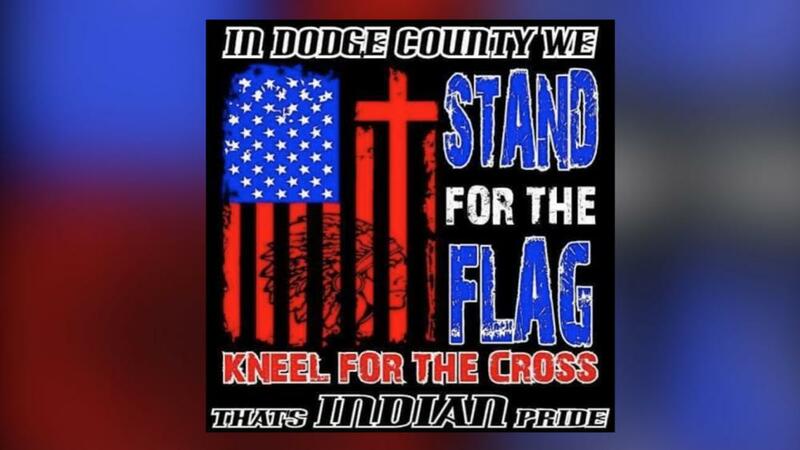 However, one school board member found the T-shirts offensive and said they were “politically divisive” according to Starnes.Shirley Ikedionwu is the board member who was offended by the shirts. “At this point, the shirt will no longer be sold,” she declared in a Facebook post. “This shirt is not only one-sided but offensive. I can’t imagine how our children would feel entering a place that is supposed to be welcoming and accepting of students from all walks of life, beliefs, and perspectives – but instead, they are faced with this type of exclusionary message,” she posted. Another resident, Bill Tripp, told local news reporters that he comes from a military family and has a son currently serving and two daughters-in-law also serving our country. “I don’t see anything wrong with that shirt. The South is known for being the Bible Belt. If you can’t stand for the flag and you can’t stand for the cross – I don’t know what you can stand for,” he told the Todd Starnes Radio Show. Since the shirts couldn’t be sold at school, several local businesses helped the cheerleaders sell them off campus. They have since received orders from everywhere, not just the community. Nikki Mullis of White Hat Auto told Starnes that they even got orders from as far as Afghanistan. “I’m standing because it has the United States flag on it and the cross. Those are two things I will back any day of the week,” Mullis also told Starnes.